Extreme elegance, spectacular service and architectural magnificence – the Burj Al Arab is a mark of true luxury. 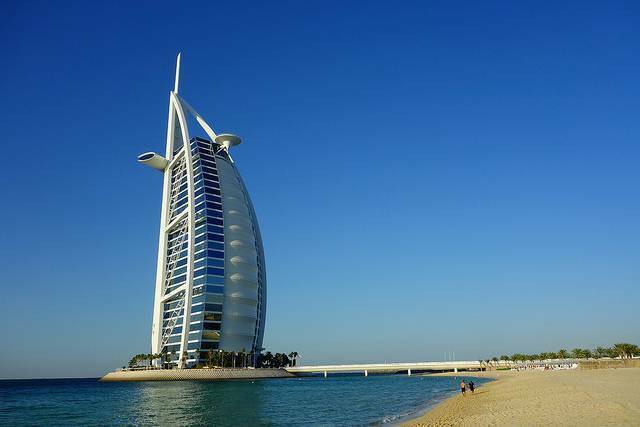 Situated on a private island, the Burj is only accessible by a bridge with restricted entry. Hence, all bookings have to be done well in advance. The best time to visit is around 4p.m. for afternoon tea, at the Sky View Bar on the 27th floor of the structure. The hotel overlooks the shimmering Gulf, and the sunset fills the sky with tantalizing shades of orange, pink and yellow. A truly spectacular sight, complimented with mouthwatering food and superb service leaves all guests astounded. The Burj Al Arab is also renowned for its underwater restaurant, Al Mahara where all diners are left amazed by the sight of vibrant marine life swimming beside their table, while simultaneously gorging on an extravagant meal. Apart from these award winning restaurants, the Burj Al Arab is known to treat each guest as royalty. The staff is extremely helpful and will ensure that all demands or requests are met. One visit to this hotel is life changing, as it completes engulfs each visitor into a world of grandeur and majesty like never before.